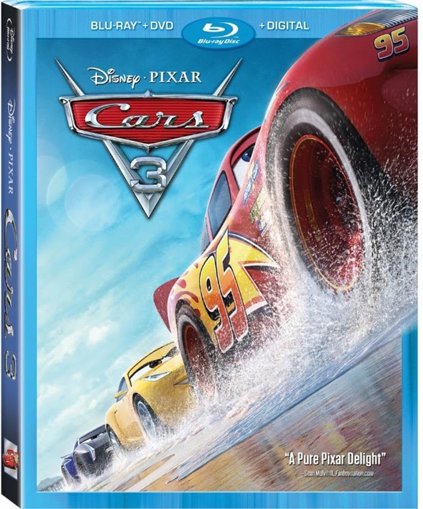 Pixar Cars 3 Blu-Ray and Blu-Ray 4K Ultra HD Available Tomorrow! Pixar Cars 3 Available on Blu-Ray Tomorrow! If you’re looking for something new to watch for a fun-filled family movie night, Pixar Cars 3 is the perfect choice! Cars 3 is my personal favorite Pixar Cars film, and I can’t wait to see the movie again at home with my daughter with Pixar Cars 3 Blu-Ray when it comes out tomorrow November 7th, plus watch all the bonus features! Let’s. Get. Crazy. – Learn about the rules of demolition derby. Legendary – A historical look on racing legends Wendell Scott and Louise Smith. Ready for the Race – A look at the Hendrick Motorsports campus that influenced the filmmakers. World’s Fastest Billboard – A look at all the advertisements on the race cars in Cars 3. Cruz Ramirez: The Yellow Car that Could – Join Cristela Alonzo (Cruz) and the filmmakers on the journey to creating this new character. Generations: The Story of “Cars 3” – How this new story of Lightning McQueen’s was developed. My First Car – Illustrated car stories narrated by the Cars 3 cast and crew. Cars to Die(cast) For – A look at the phenomenon of die-cast cars. Starting tomorrow November 7th you can find Pixar Cars 3 on Blu-Ray for purchase in stores and online.